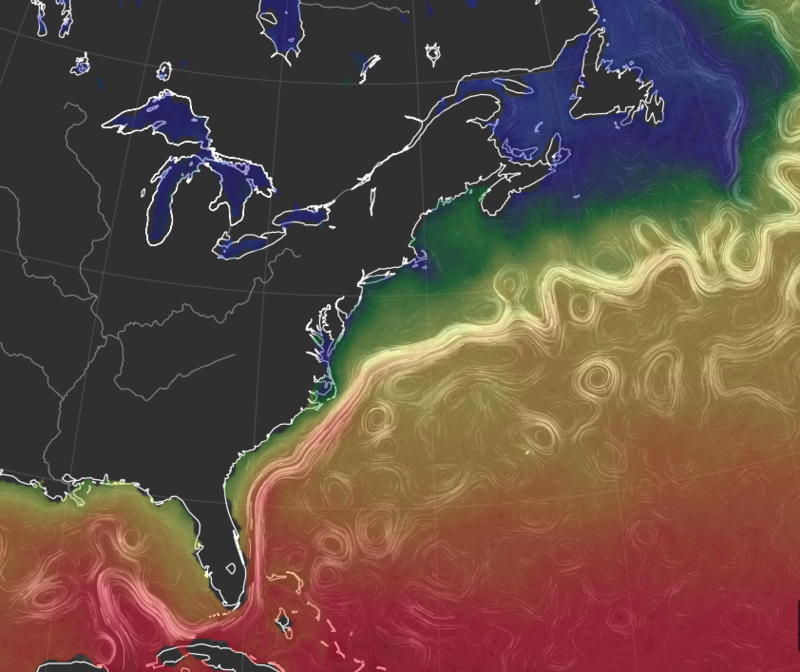 While Dr. Wilson is away on leave this semester, I am going through 15 weeks of “Climate Monday”, in which every week I get the opportunity to highlight one graphic or animation or data tool that shows something interesting about climate (and weather). 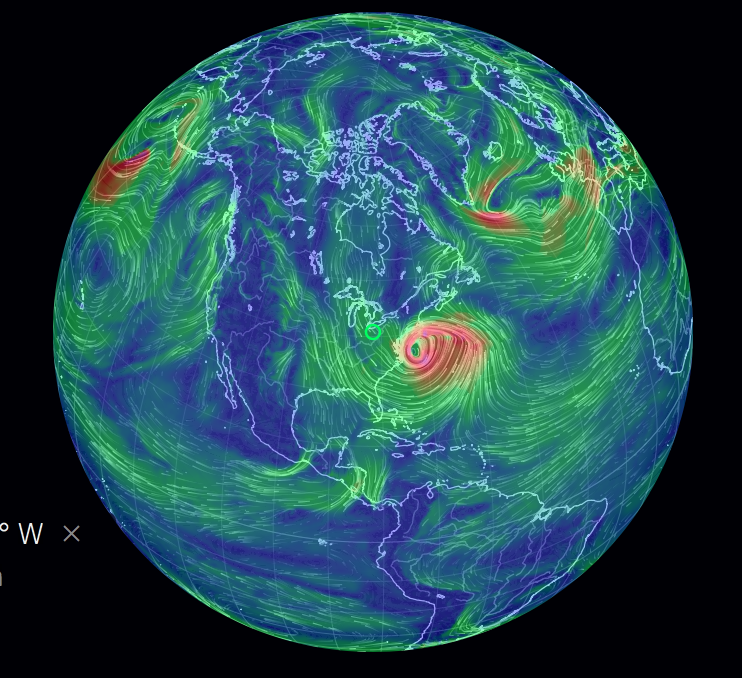 I’m also using these tools to share a little climate science. Last week I highlighted a weather animation tool, so this week is fully in the realm of climate with NOAA’s animated Keeling Curve (also on youtube). Humans have decades of direct observations of carbon dioxide concentration in the atmosphere. The longest continuous record dates back to March 1958, when C. David Keeling started analyzing air at the Mauna Loa observatory in Hawai’i. 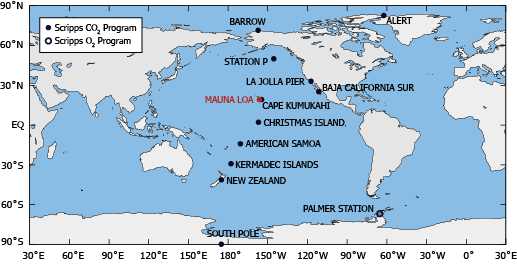 Mauna Loa is a good place to make such measurements because Hawai’i is isolated from major industrial regions like the Midwest of the USA, the Ruhr Valley in Germany, and the Pearl River Delta in China. There is relatively little regional pollution (although there is some from cities like Hilo and Kona, and from nearby islands like Oahu and Mau’i). The composition of the air in Hawai’i is a better reflection of the Earth’s average atmosphere than measuring, say, at LAX or O’Hare. Atmospheric measurements have been made up on Mauna Loa ever since. 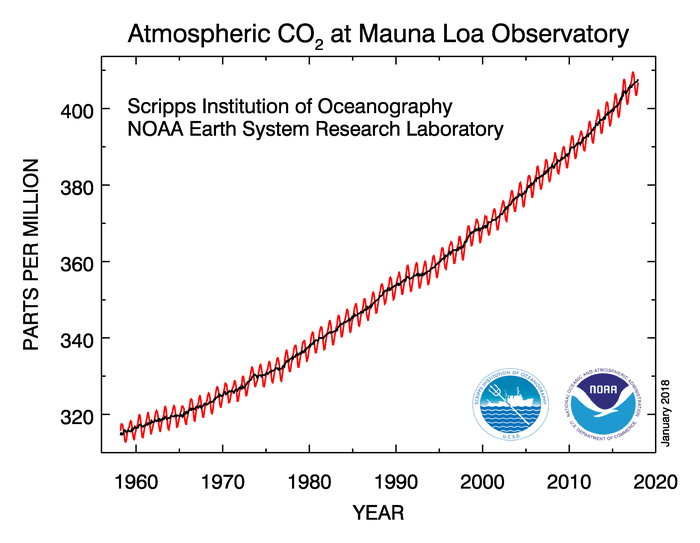 The resulting data is the Keeling Curve, which is plotted below. The “sawtooth” pattern of the red line is the seasonal cycle of winter and summer in the Northern Hemisphere. In summer, plants take up carbon dioxide during photosynthesis, reducing carbon dioxide concentration. In winter, photosynthesis slows or stops throughout much of the Northern Hemisphere, and carbon dioxide can accumulate in the atmosphere. So carbon dioxide is always a bit higher in winter than it is the following summer. The black line has the seasonal cycle removed, so it shows the year-to-year changes in carbon dioxide. It also shows the increase from under 320 ppm in the 1950s to over 400 ppm today. This is all really cool to seem but there is much more to our record of carbon dioxide than just Mauna Loa. NOAA has put together an animation that shows all of the dozens of other sites around the global that record carbon dioxide concentration and how that record has changed through time. It also puts that record in the context of paleoclimate. 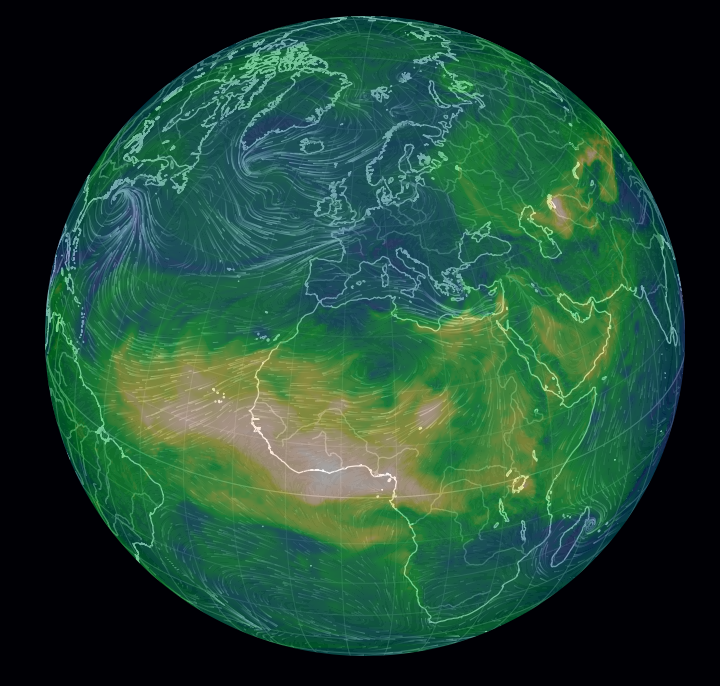 Seeing the whole animation, you can detect all of the nuance in the global carbon dioxide record. For instance, the Northern Hemisphere has a much stronger seasonal cycle than the Southern Hemisphere since it has substantially more land plants at mid and high latitudes. Other locales are even more variable, like many in the continental USA closer to major industrial centers. The South Pole generally lags a little behind the Northern Hemisphere, in part because it takes awhile for carbon dioxide emissions to mix throughout the whole atmosphere. Today, CNN and several other news outlets are reporting that “Boston and part of New Hampshire will be colder than Mars” this weekend. At first glance, this sounds incredible. It’s going to be really cold this weekend! Indeed, on Saturday, the coldest day forecasted, Boston is expected to see a low of -7°F (The Weather Channel), -4°F (AccuWeather), or -2°F (Weather Underground)… so yes, this is cold. CNN headline from January 4, 2018 declaring that “Parts of the East Coast will be colder than Mars”. But there are two things misleading with the statement “Boston will be colder than Mars”. First, the statement makes you think about this cold snap is a big extreme. The thing is, Boston can get colder. Last year on February 14, the low was -9°F, and on February 9, 1934, Boston had its record low of -18°F (NOAA). Normally, the coldest temperature of the year in Boston is about 2°F (ibid.). So this isn’t unprecedented, even though it’s rare. It’s an extreme, but nothing to put down in the history books. The second misleading part is the comparison to Mars. Yes, Mars is roughly 1.5 times farther away from the Sun than we are, and it has almost no atmosphere, so it on average much colder than Earth. In fact, the average temperature on Mars is about -81°F, whereas Earth is about 57°F (NASA Mars Facts). But wait! -81°F is much colder than Boston has ever been. So what gives? The numbers CNN are using come from the Rover Environment Monitoring Station (REMS), which was deployed in Gale Crater along with the Curiosity Rover. If you go to the REMS page and use the arrows on the big weather widget to go back to December 31 (Earth time), you’ll find a temperature of -19°C, or -2°F, as the maximum at Gale Crater. That’s warmer than (or as warm as) Boston is expected to be this weekend. But this is a bad comparison because they compared the low temperature in Boston to the high temperature on Mars. Compare to the low temperature in the Gale Crater instead, and you have -79°C to contend with, or -110°F. So based on the lows, Mars is still colder than Boston. Air temperature reported by the REMS instruments aboard the Curiosity Rover in Gale Crater, Mars on December 31, 2017 (Sol 1921). However, there are two other things that make this comparison misleading. First, they are comparing Boston, at 42°N on Earth to the Gale Crater on Mars, at 5.4°S (REMS). They are comparing a mid-latitude location in winter on Earth to a location near the Equator of Mars. The Equator of Mars is relatively warmer than the mid-latitudes of its winter hemisphere. Second, Boston in winter is often colder than Gale Crater. Mars has very little atmosphere and no ocean, so daily and seasonal temperature swings at the surface are much greater than on Earth. In summer, Gale Crater can exceed 32°F. In fact, if you look back to when Curiosity first landed on Mars, it recorded a high temperature of 37°F on Sol 10. (See that lower graph on the REMS page.) The average high temperature in Boston in January is only 36°F (NOAA). 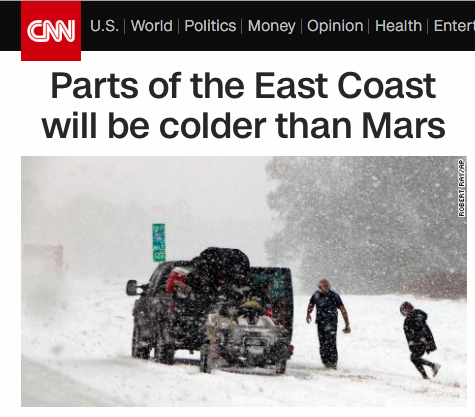 So being “colder than Mars”, at least based on CNN’s loose phrasing, is not particularly strange. With all that said, it will be cold in Boston this weekend after the blizzard, so bundle up, New Englanders!